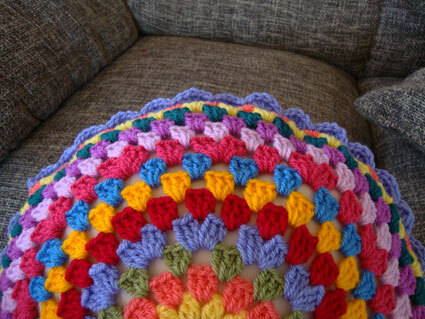 Home/colors and yarns, Crocheted cushion, granny squares, Uncategorized/Round granny cushion! I just want to begin this post by thanking every single one of you for all these sweets comments you are leaving on my posts…It is making me really happy reading them:) Thank you again …You bring sunshine to my mornings! But I think it’s cute, don’t you? Your blog is beautiful! I have just discovered its wonder of beautiful inpirational ideas!! Wow your amazing! I am so inspired..I like to change color alot but hate, the ends! Do you have any secret for getting rid of the ends??? Thanks for all your inspiration! 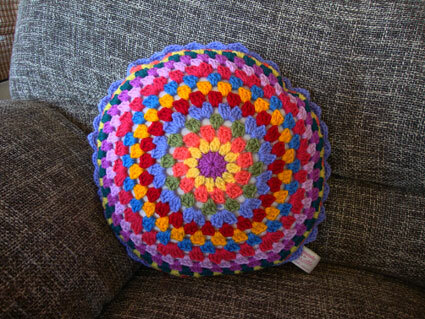 Your granny round cushion is wonderful and I love the idea of your new project. J’adore ton blog ! Thank you all for ur comments! I hope I made it clear with my not-so-good-english! The bright colours on your blog make me smile, it is very beautiful! 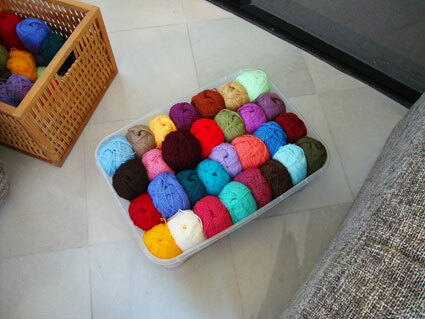 I am busy myself with a ‘grannymonster’ as well, in 10 different blue yarns. It is a lot of work, but very nice to work on and switch colours all the time. None of them are the same! Hey Sucrette, my monster is on the crochet-page on creJJtion… hope you’ll find it there! 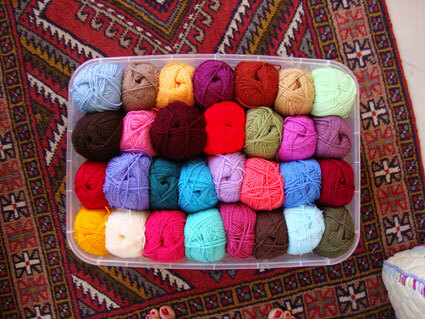 You bring sunshine to all of us with all your wonderful crochet – I am so enjoying your blog. 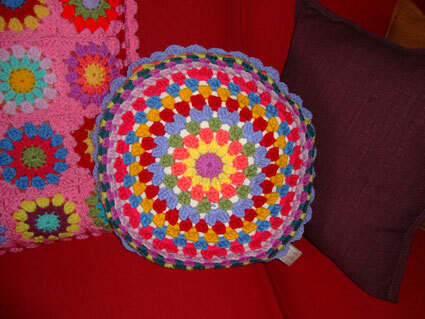 I love your round cushion, it’s so pretty and that box full of lovely yarn is absolutely to die for. I am loving your colors and creations! In the past few days I have become obsessed with your site. I don’t know when I’ve been so inspired. Thank you! I do wish I knew more about the yarn you use. Do you always use the same brand? Is it wool or a blend? Help! Thanks!